Rear Tine Tiller is the garden tool for tilling a large area with the rough, compact ground. It differs slightly in design from the more common garden tiller (or front tiller). A front tiller has blades in front of the engine and machine driving it. A rear tine tiller, on the other hand, has the blade at the back of the machine and engine. Since the engine pulls the tines, rear tine tillers can dig much more in-depth. Serious gardeners now choose to prepare their large, compact gardens with rear tine tillers. I assume you are here because you are looking for the best rototiller for a large garden. Today, many brands are producing various quality tillers. It makes increasingly challenging to arrive at the right choice. 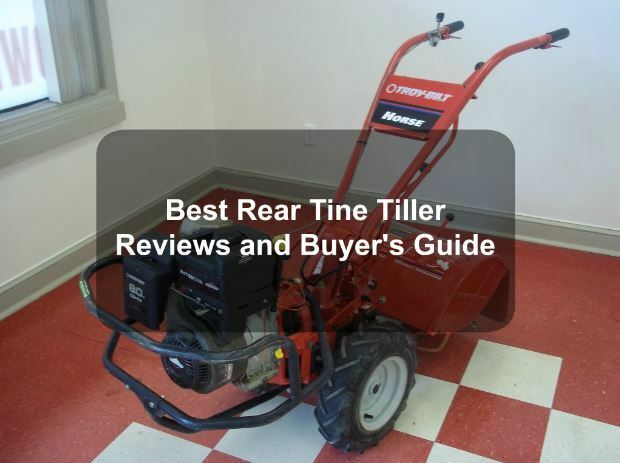 This review aims at providing you with helpful information to get a rear tine tiller to meet your needs. Choose the YARDMAX Dual Rotating Rototiller for maximum power, maximum value and maximum support. This machine by sight alone is a guarantee for a job well done. It combines practicality with and performance to deliver a service beyond the obvious. The tool is perfect both for a homeowner and a professional. The garden cultivator is a true dual-rotating rear tine tiller that delivers flawless groundbreaking as well as garden preparation in any soil type. It features forward rotation ideal for cultivation and a reverse rotation for deeper soil tilling. The tool gets its power from 208 cc, Briggs &Stratton engine. The engine delivers an incredible 9.50 ft-lbs gross torque and a 190-revolution per minute rotational speed. Such power is coupled with heavy duty, durable YARDMAX transmission featuring self-propelled drive system. The result is a powerful forward movement and a single reverse gear for effortless control. The machine’s 18-inch wide rear tine design with seven depth adjustments as well as a 6.5-inch working depth ensures you cover more ground rapidly. Your work will be made even easier with the tines 13-inch self-sharpening tines. YARDMAX YT4565 is easy to use especially with its improved handling. It features one-hand operation with lets you stand and steer on either side of the cultivator. There is also an easy to adjust drag bar for improved balance in all conditions. For further balance and handling, the tiller comes with front counterweight on 13-inch pneumatic wheels with AG tread tires. Adjustable serrated rear shield and side shield enhance performance and safety. Champion 19” Rear Tine Tiller is versatile thanks to its 19-inch tilling width and an 8-inch tilling depth. In support of the versatility is the dual rotation feature which allows you to switch quickly from the forward to reverse for more flexibility in your garden. It features a cast-iron, gear-operated transmission that is housed in a compact and heavy-duty cast-iron casing. Champion’s 212cc engine drives the gear system. 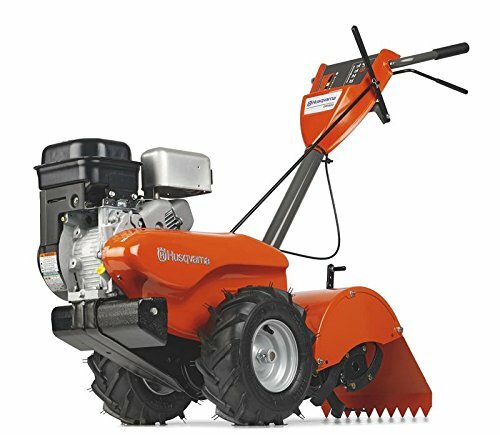 The engine and the gear system offer enough power to tear through even the most compact soil including virgin grounds. Sod and grass cannot stand on its way. You will also like the tiller’s agricultural tires. The 13-inch tires are self-propelled that power effortlessly over uneven and rugged terrains. The self-propelled tires move fast allowing you to achieve much in less time. Very few models feature self-propelled agricultural tires feature sets the rear tine tiller apart from its competition. The tiller is equipped with 4 heavy-duty 13.5-inch tines made of hardened steel with dual rotation tilling. These are engineered to manage even the toughest of soil conditions with minimal effort and time investment. The machine comes with Champion’s 2-year limited warranty which includes free lifetime technical support from qualified and dedicated technicians. The SRTT196 Rear Tine tiller from Southland is one of the best in the market. The tiller equipped with a powerful gas-powered engine. It is a 196cc 4-cycle, 9.6 foot-pound OHV engine that pulverizes any soil type it contacts. The engine pulls 11-inch tines capable of providing 18-inch tilling width and 10-inch depth. However, a depth regulator allows you to adjust for your desired depth. The tines counter rotate to break ground faster. Even more interesting is the fact that the tines designed to self-sharpen. You will not need to dismount the tines to sharpen them as is common with other brands. The engine has manual recoil start located in a readily accessible part of the machine. Such starter is convenient as it allows you to start the machine right away. The SRTT196 Rear tine tiller features an advanced and convenient gearing system. The system consists of a forward gear lever and a reverse lever. It allows for forward and reverses tilling. The benefits of this gear system are far-reaching. Unlike models with single direction gear lever, you will not have to stop the machine to change direction. The tiller equipped with two large, garden type tires measuring 13-inches. The tires are pneumatic and are very versatile. They can handle any terrain, soil type, and any soil condition. The high-quality tires are great maneuverability. Husqvarna is a common household name. It is because many people associate the brand with high-quality products. One such product is the Husqvarna CRT900L 17-Inch Rear Tine Tiller. This machine provides you a wide range of features at the mid-range price. Such features make this rear tine tiller one of the best in the market. A reliable 205cc Briggs & Stratton engine offers the machine the power for most tasks. This engine offers a tine rotation at a speed of 210 revolutions per minute. Such speeds guarantee fast tackling of virgin ground or even clay soil. With a 3-quart gas tank, you will not have to stop to refuel the machine. The result is quick and convenient tilling. 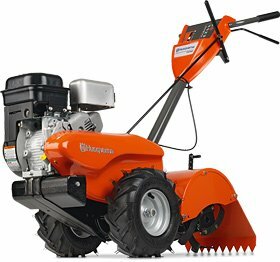 The Husqvarna rototiller provides only reverse and forward gear option. It means you cannot adjust the tiller for power or speed. But the reverse gear offers easier tilling since you just walk back when you reach the end of the garden. It will eliminate the need to lift the machine up and turn it the opposite direction. The tines counter-rotate for more efficient tilling. This machine is designed to make your work more manageable in the face of heavy labor. 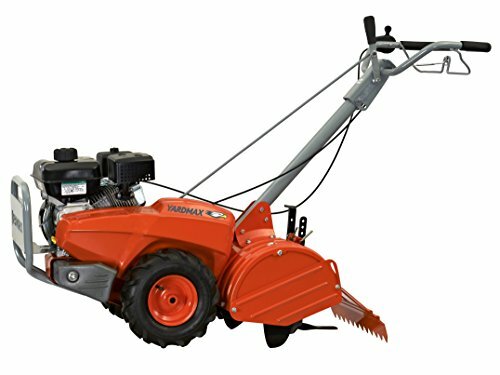 It features 13-inch steel tines that counter rotate to provide you with the power you require to pulverize virgin soil, compacted soil, sod, grass, and clay. The tines cannot stop working even if it encounters small roots that may be lurking underground. The Poulan Pro rear tine tiller uses a 208cc LCT OHV engine which is powerful and operates smoothly. OHV engines are known for fuel efficacy, powerful performance, and long lasting service. The engine runs efficiently and operates with coolness for years regardless of the level of use. The secret to the high performance of the Poulan Pro is its heavy-duty chain drive transmission featuring power reverse. The forward and backward capability offers efficient tilling. The powerful, durable design allows for easy transport in the reverse mode while drives the tines in the forward mode. It is fitted with a split loop handle that you can raise or lower as you desire. The adjustability of the handle means you can choose the most convenient position and height. 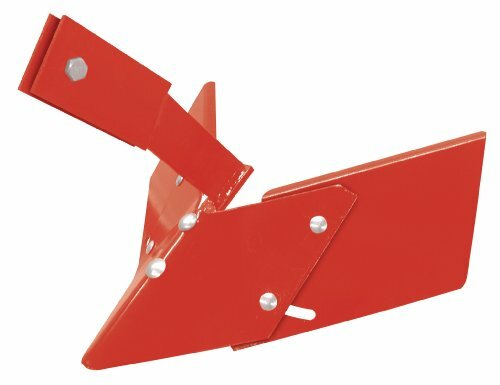 This allows for single-hand operation from either the right or left side of your tiller. Thus both left and right-handed users can operate it without a problem. Husqvarna Counter Rotation Rear tine tiller is a great option if you prefer a heavy-duty unit to handle more demanding tasks. It offers you more power which makes it an excellent choice at a slightly higher cost. Each of its components is built for long life and optimal performance in all types of soil. 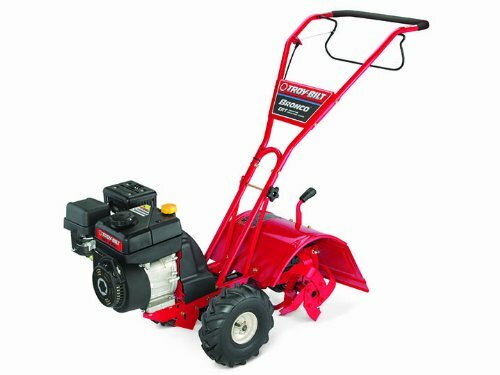 It comes with an easy to start 205cc Briggs & Stratton engine that has enough power to chew through compacted soil, sod and grass. A counterweight feature aims at enhancing the weight on wheels for improved balance and stability for safe operation. This feature ensures it works perfectly even on uneven or rugged terrains. The machine features tines that counter-rotate for deep-digging or making the ground surface ready for cultivation. The forward and reverse capability means enhanced control and maneuverability. Beginners have no reason to worry because of the ease of use provided by these unique features. At 14-inch tilling width and adjustable tilling depth, you can be sure the machine will do the job fast and efficiently. It is equipped with Chevron tires to ensure maximum grip and improve traction in different terrains. It is enough to say that this Husqvarna rear tine tiller is one of the most powerful, smooth to drive and well-balanced rototillers currently in the market. The Troy-Bilt Bronco Gas Powered rototiller will guarantee the work done well and in expedition. The efficiency of its 208cc 4-cycle engine makes it ideal for both professional and home use. From its look, the machine seems lightweight and compact but the Bronco counter rotating tiller is offers incredible power. The compact design is practical. Troy-Bilt’s aim was to ensure the cultivator fits between narrow rows with ease. The tool’s 10-inch diameter bolo tines will break through tough soils effortlessly. Similar to other counter-rotating tillers, this unit has a single forward and reverse rotation. The forward rotation cultivates the soil while the reverse rotation ensures finer and deeper tillage. A 14-inch tilling width may not be as wide but it still offers good coverage for rather fast cultivation. Such tilling depth if combined with 6-inch adjustable tilling depth ensures proper land preparation for different plants. The Troy-Bilt Bronco features an all-gear drive with cast iron transmission for easy operation. The counter-rotating tines also provides for greater control and easier use. It’s fitted with 11-inch by 4-inch pneumatic wheels for easy maneuverability even on bumpy terrains. The machine’s small design allows for single-hand operation. An adjustable padded loop handle and foam grip offers comfortable handling. The engine is potentially the lifeline of any machine. Tine tillers are not different. A faulty engine means less than optimal performance for your tool. 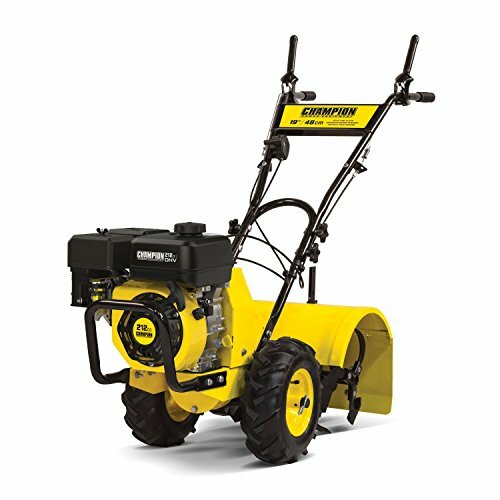 In choosing the rototiller to purchase, consider its engine. Either 2-stroke or 4-stroke engines power these tools. As the name suggests, the two-stroke engine is a type of internal combustion engine that completes its power cycle in two cycles (up and down movements) of the piston following a single crankshaft revolution. Such engines have a high power-to-weight ratio. The downside of the 2-stroke engine is that it causes more emissions than a 4-stroke model. This is because it uses petroil (gas/oil mixture) lubrication both of which burn in the engine to create soot. Furthermore, the engine is quite noisy. Those who prefer 2-stroke engines are impressed by its power. The 4-stroke engines operate quietly, more fuel efficient and very reliable. The engine features internal combustion but completes its power cycle in four strokes (intake, compression, power, and exhaust). There is a separate tank for gas/fuel and chamber for lubrication oil. This preserves engine life and boosts its fuel consumption. Furthermore, this type of engine is incredibly eco-friendly. Most high-quality rear tine tiller engines have 4-stroke engines. Despite their inefficiency, 2-cycle engines can be potent. Tilling depth is the primary determinant of how fast you will complete your job. Rear tine tillers with the most significant tilling width work more quickly. It is because they will shred the most ground with each pass. However, tillers with large tilling width may be difficult to control. It would be wise to go for a balance between breadth and controllability of the machine. I would recommend a tilling width of between 17 inches and 18 inches. Many modern rear tine tiller models will feature adjustable tilling depth. But, some models will dig deeper than others. The major determinant of tilling depth is the growth characteristic of each seed. Certain seeds may need very deep soil to grow well. It is, therefore, safe to buy a rear tine tiller with good depth. I would recommend 10 inches tilling depth. How tines rotate has a bearing on soil aeration. It is common knowledge that counter-rotating tines are the most efficient. They stabilize the machine and allows for better control. Standard (forward) rotating tines may also shred rocky compacted soil with ease. The other type is dual rotating which feature both forward and counter-rotating mechanisms. Choose a counter-rotating tine model if the kind of earth in your garden is predominantly clay. Manual start involves pulling a cord to start the engine. Most traditional rear tine tiller models feature manual start. However, the modern models equipped with electric starters. The latter types allow you to start the engine with a simple push of a button. Compare two tine tillers of the same quality and capabilities. The one with electric starter will be hundreds of dollars more than the manually started one. The difference is the ease and convenience the electric starting model brings. Would you sacrifice hundreds of dollars for this simple feature? The tires of any tine tiller are the significant determinants of its control. They also determine the maneuverability of the machine. Good tires make the machine easy to control and maneuver. They should have excellent flotation and traction in all types of soil and terrains. Tires with good treads will grip clay soil well. Good quality tine tillers have pneumatic tires of 13-inches in the least. Tine tillers can have handlebars that are either fixed or adjustable. Adjustable handlebars are great. They also give users the flexibility to adjust the handle to their height. It improves maneuverability and comfort-ability during extended use. Models with fixed handlebars are not as flexible, but they have other features of comfort. Try the best you can to buy a best tiller for breaking new ground with at least two speeds. One speed for forwarding movement and the other for reverse movement. Those models lacking reverse gear may get into trouble should the machine get stuck. You will have a tough time getting it unstuck. High quality and often high price tag models feature variable speed. I would not advocate for those models. The must-have feature an ideal rototiller is neutral gear. This feature makes the machine easy to transport. The decision to buy the best rototiller means you are also ready to give it the best care so that it can deliver optimally. These machines can use many accessories to widen their scope or boost their performance. Keep in mind that some models only accept accessories by the same brand. Checking for compatibility before buying any accessory is crucial. Here are the essential accessories you need to plan for once you own a rototiller. Once you have given your garden a thorough and satisfactory till use a furrower kit. This accessory allows you to save time by designing uniform, deep planting rows that are seed or seedling ready. 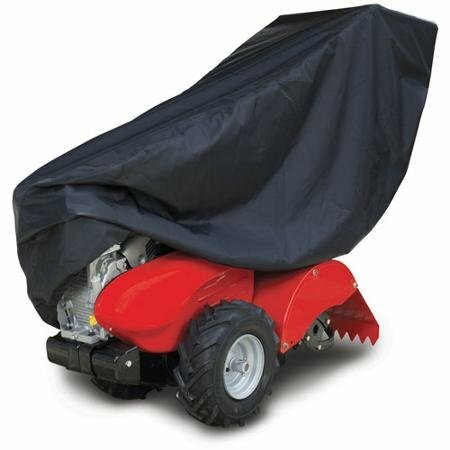 A rototiller cover keeps dirt, water, debris, weather as well other negative environmental influences out of the motor. The best cover should be made from a water-resistant fabric or other material that is also abrasion resistant. It is my conviction that this in-depth review of to 7 best tine tillers has proved helpful to you. Only a high-quality rototiller can handle all manner of terrain. It will not spare even rough, compact virgin ground. These seven are genuinely the market's best. They may have overlapping features but each is unique. All have powerful and efficient engines, excellent transmission and ideal tilling measurements. The review aimed to provide you with a starting point. If you do not like our picks simply use our buyer's guide to help you make an informed choice. Nonetheless, I guarantee you will love our choices. what rear tine tiller has a “free wheeling” neutral so you can roll it without running? All rear tine tillers have “free-wheeling”. 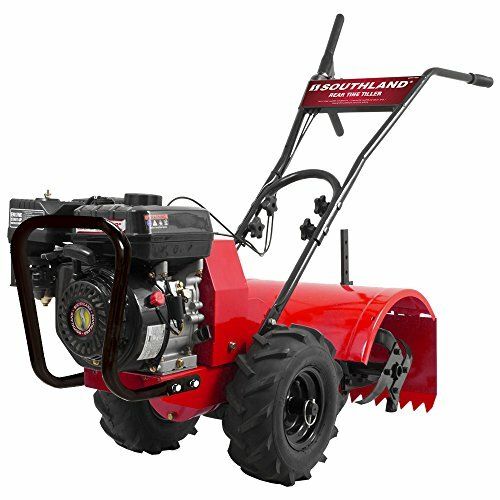 I recommend, “Southland SRTT196E Rear Tine Tiller” it’s the best choice for you. Southland SRTT196E Rear Tine Tiller has no “neutral” (because it’s a worm gear and a 1-piece transmission, it’s easy for the engine to turn the shaft, but hard for the wheels to turn the shaft). If you want to roll it without running, you’ve got to pull the pins out of the front-wheel axle so that the wheels can just free-wheel – you can then slide in the wheels, and slip the pins back in the shaft so that the wheels don’t work their way off without the pin through them.